Students in hospitality majors at Pennsylvania College of Technology will display their wedding cake creations on March 3 in the college’s Thompson Professional Development Center. The students spend weeks decorating their fondant-covered cakes for a competition that will be judged by industry professionals. Following judging, the cake display is open to the public from 10 a.m. to 2 p.m. in the Professional Development Center’s Mountain Laurel Room. A winning entry from a previous wedding cake competition at Penn College. 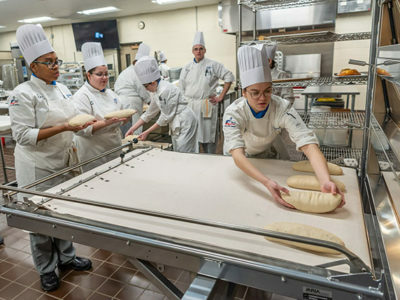 This year’s competition is scheduled for March 3, with the cakes to be displayed for the public from 10 a.m. to 2 p.m. in the Thompson Professional Development Center. Visitors may donate cash to cast a vote for the People’s Choice Award winner. Money raised through voting will be given to the Williamsport YWCA’s Liberty House, which provides rooms for homeless women and their children, as well as programs to assist them in becoming self-sufficient. Participating students, all enrolled in an advanced cake decorating course taught by Chef Sue L. Mayer, assistant professor of baking and pastry arts/culinary arts, are: Rachel C. Bryant, of Wellsboro; Rachel C. Cooper, of Bangor; Shannon E. Croney, of Lake Ariel; Marissa R. Dimoff, of Mount Union; Jessica N. Felton, of State College; Sarah B. Fiedler, of Lock Haven; Daniel C. Frankenfield, of Dushore; Kelsey L. Park, of Bellefonte; Tiffany A. Reese, of Wellsboro; Liliana M. Strunk, of Avis; Ana N. Uribe, of Lewisburg; and Jenna Zaremba, of Pottsville. Following the competition at Penn College, the top three cakes will be displayed at the National Capital Area Cake Show in Fairfax, Virginia, on March 20-21. Cakes will also be exhibited in the college’s Madigan Library main floor through the college’s March 28 Open House. To learn more about hospitality majors at Penn College, call 570-327-4505. Thank you so much to everyone from the YWCA!